The ninth 'Hyakudan Hinamatsuri' exhibition at the Hyakudan Kaidan exhibition hall, the Tokyo metropolitan government-designated cultural asset, in Hotel Gajoen Tokyo brought together approximately 500 dolls, mostly antique, from Shiga and Gifu prefectures. Hina dolls are traditionally displayed at the 'Hinamatsuri' festival on March 3 to wish for the well-being of girls. 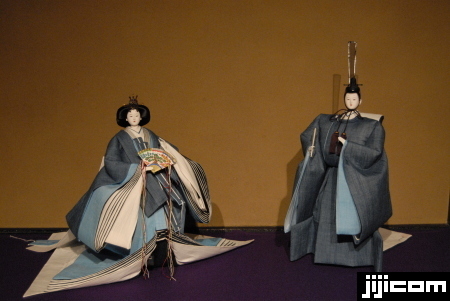 Most of the dolls represent the Emperor and the Empress, as well as palace attendants and musicians in the Heian period.